Stay back, all the way back to the tower and defend if you must. If you have a friend with you, be bolder and poke the enemy whenever the opportunity arises. The Morning Star should be your first choice. Tel’Annas’ attack damage is increased by 8% when there are ally heroes nearby. One of the main reasons why Tel'Annas should not be solo. 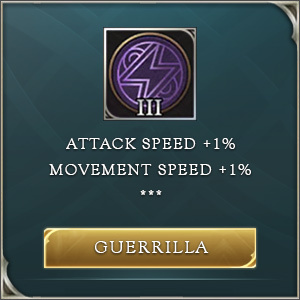 After learning this ability, Tel’Annas’ normal attacks reduce the target’s movement speed by 6%. Stacks up to 5 times. 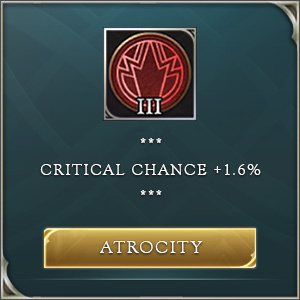 After activating this ability, Tel’Annas’ range significantly increases and her attack speed increases by 30/32/34/36/38/40% for 3 seconds. Also, her normal attacks are imbued with dark power and deal 50/58/66/74/82/90 (+55% of AD) magic damage and an equal amount of physical damage (both damages are capable of striking critically), While active, normal attacks place an additional stack of the movement speed reducing the effect. The range is 800 units. The range of the ability is 950 units. The ability has more range than towers, you can poke them from a safe distance. Tel’Annas fires 3 arrows simultaneously, dealing 275/335/395/455/515/575 (+60% of AD) physical damage to enemies in their paths and reducing their movement speed by 40% for 2 seconds. Each enemy hero hit increases movement speed by 20% for 1 second. The range is 1000 units. Slow stacks with Eagle Eye. After charging for a short period, Tel’Annas combines the power of Darkness and Morning Star and fires an Arrow of Chaos, dealing 200 (+60% of AD) physical damage. 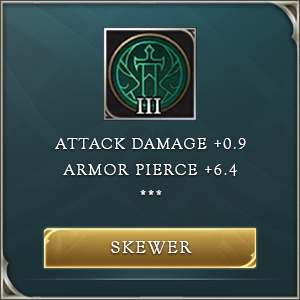 Enemies further away take more damage, up to 400 (+100% of AD) physical damage. Enemies along the arrow’s path are knocked back and stunned, with enemies further along the path of the arrow stunned for a longer period. The range is 1400 units. It pierces through all enemies in its path. All of her abilities have crowd control/slow built-in. Paired with her range, Tel'Annas can kite enemies effectively. This is also useful for chasing enemies, as you can almost make them immobilized. Tons and tons of damage. 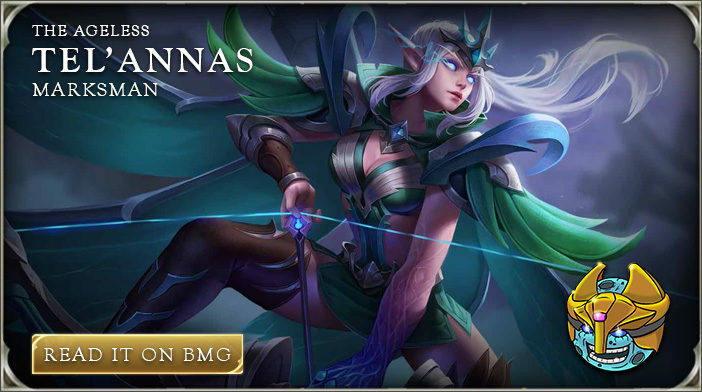 With the right set of items, Tel'Annas is a fearsome foe and everyone will think twice before rushing into the enemy team with her around. She can melt even the tankiest of foes with ease. Long range abilities. All of her abilities have longer range than most heroes so you can stay all the way back and you'll be safe while still being actively involved in a fight. Tel'Annas is squishy like most marksmen and you need to keep her safe and play carefully. She has no means of escape, so you need to take the Flicker talent. This is particularly useful when the enemy team has one or two gap closers. More than that and you'l have to rely on allies for help. Priority for leveling skills as Tel'Annas: The Morning Star should be your first choice. Since Tel'Annas is weak early in the game, you need to be extra careful. You can't deal a lot of damage and you can't tank any damage but you still have your range and that is a straw you need to hold on to. At least until you get some better items and unlock your ultimate. Stay back, all the way back to the tower and defend if you must. If you have a friend with you, be bolder and poke the enemy whenever the opportunity arises. If you are sure that you won't be ganked (foes dead or far away from you) use your range to poke the enemy tower with Morning Star. Make sure you stay just outside the range and you can shoot the tower with it. You can actually initiate team fights with Tel'Annas as soon as she gets her ultimate. It has an awesome range so you can hit some unaware foes with it and stun them. If your team moves up, follow behind them if they don't pull back. You can also let the enemy initiate and the pattern is the same. Use your ultimate, The Morning Star is your next move, and you can spam normal attacks from afar while slowing the enemy. You can use Penetrating Shot, or you can save it for running foes. If the fight is going in your favour, be more aggressive and lower the gap between yourself and their backline, so you can slow them in case they try to retreat.